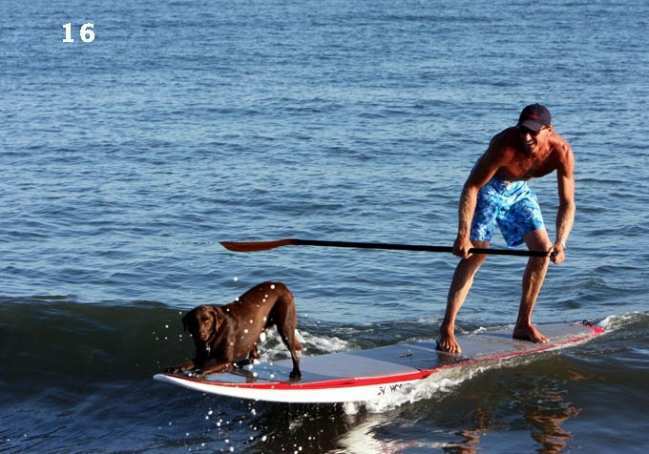 Standup Paddling (SUP) has quite a following, even among dogs! Who knew? It appears to be a hybrid between surfing and calm water kayaking, but I can't say I have tried it myself. Standup Paddle Magazine sure knows that their readers enjoy sharing their activities with their dogs. They host and annual SUP for a Pup benefit for animals in need. Donations go to A Wish for Animals, a volunteer run rescue in the Southern California area. To raise awareness this year, Standup Paddle Magazine is hosting a photo contest. Click here to check out the submissions and vote for your favorite (top dog wins a cool life vest). It looks like a fun activity for dogs of all shapes and sizes, and it is for a good cause. Wags to my favorite four legged surfing dog, Surf Dog Ricochet, for the tip. She asks that we vote for picture #1 because the woman pictured is very active in the adaptive surfing community-an activity very close to Ricki's heart. It is really great that so many hotels are now pet friendly. Some even offer additional amenities for the vacationing pooches. But did you know that lots of hotels have weight restrictions for their four-legged guests? The restriction does not make a whole lot of sense to me--I know plenty of gentle giants that tread more lightly than dogs the size of their head. This means that the most common family dog--the Labrador-cannot travel with their packs. Giant George would surely be excluded, as well as medium sized mutts like me. 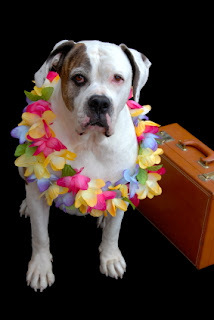 My friends at GoPetFriendly.com have teamed up with AndASmallDog.com to get the message to hotels because big dogs deserve vacations too! They have launched a campaign called Give Big Dogs a Break where they are collecting signatures for a petition they will send to hotels to encourage them to lift their strict restrictions on size. In part, the petition states, "We believe size should not be a factor in deciding which pets are appropriate hotel guests. Other factors, such as training, temperament and level of socialization are far more indicative of a well-behaved pet. By instituting alternative policies, such as cleaning charges and crating requirements, hotels can welcome large dogs and avoid the undesirable outcomes their weight restrictions are designed to prevent." Click here to read more and sign the petition! 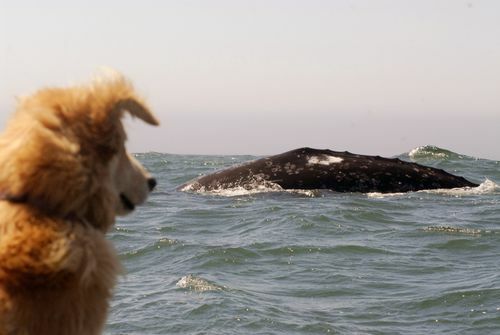 Some scientists think that whales and dogs may be able to communicate with each other. Even though the dog in this video is barking at the whale, the whale becomes submissive, even a little playful, showing its belly. That is a brave dog to get so close to a killer whale! According to Discovery News, this phenomenon is not unheard of. Carrie Newell runs a whale excursion company in Oregon, and her dog Kida loves to go along for the ride. She told Jennifer Viegas of Discovery News that "other researchers have told me that people with dogs have better whale encounters possibly because of some connection between the two. I have also observed that if I am excited and clap or call to them, then the whales feed off this excitement and approach closer." Once Kida nearly jumped into the water becuase she was so excited to "play" with her new buddy, a gray whale. Luckily, Carrie managed to grab Kida by the tail before she went plunging into the sea! When a fire broke out in a workshop by his house in rural Alaska, Ben Heinrichs told his dog Buddy to get help, and Buddy delivered in a big way. The police were having trouble finding the house, and Buddy was out there on the twists and turns of the counry roads and convinced the the police to follow him to the blaze. It was a good thing he was there--because their GPS did not recognize the back roads, leaving them helpless to find the fire without a four-legged leader. Hendrichs told the News Tribune, "I just told him, 'We need to get help,' and then that's the last time I seen him...I didn't train him or nothing. He just took off and went and did what he did. ... He was just being a good dog." The Alaska State Troopers plan to recognize Buddy for his heroic efforts. He will receive a bowl with with the seal and his name, along with the words "In appreciation of your diligence and assistance to Alaska State Troopers." Help arrived in time to prevent the fire from spreading to the house-thanks to Buddy's amazing work. Google is always working on the "next big thing." The tech company's latest strategy for going green is decidedly old fashioned and low-tech: They have real live goats come in to chew down their lawn. But dogs play a critical role in controlling these low-tech movers--without a trained herding dog, who knows where these goats would go? So, while the video below focuses on the green-ness of the goats, I just wanted to point out how important dogs are to the equation! At least the clip does show the boarder collie working hard to keep the goats in line. Happy Earth Day! Puglet the Pug has a great video full of tips tips for making your person more green, but what about your person to help you be more green? 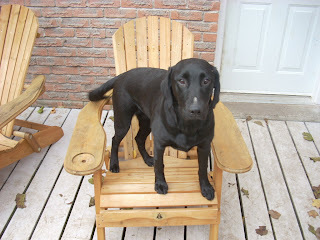 Take this quick quiz from the folks at Petside.com to measure your carbon pawprint-I scored "super green!" 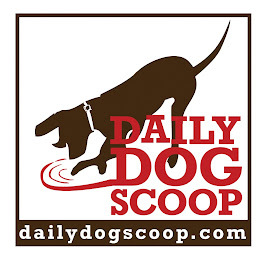 They also have lots of articles on dogs going green, including "What to do with your dog's doo." The Discovery Channel's Planet Green has the top 15 tips for going green with your pet. 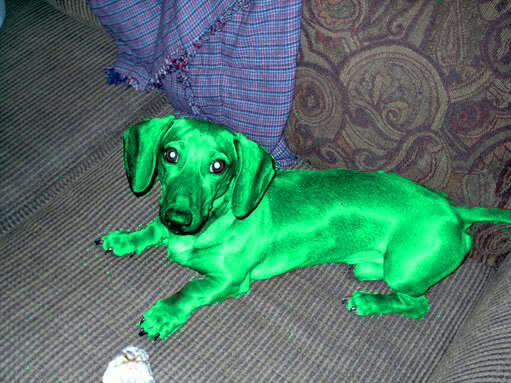 It is important to remember that adopting and spaying/neutering your pet is not only responsible, but it is also green. My friends over at ThePhillyDog have some great tips, even for dogs that don't live in Philly. Some are pretty simple--if your person buys you treats, make sure they recycle the cardboard box they came in. She even has some ideas for repairing toys instead of throwing them out, and where to find eco-friendly new toys. Let me know if you have some tips on your site or blog and I can add them here! As a dog, running the house is just part of my job. Running a city, though, I am not so sure about that! Well, Genny would like to be elected mayor of the Canadian city of Clarington. Her person, Marven Whidden tried to register Genny as a candidate, but was told she could not run becuase she is a dog. They have not ruled out a write in campaign. According to the Toronto Star, "while kissing babies may not be her thing, she does a mean face lick." You can read more about the saga on Whidden's blog, where the pair has received both criticism and support. They have created quite a stir! 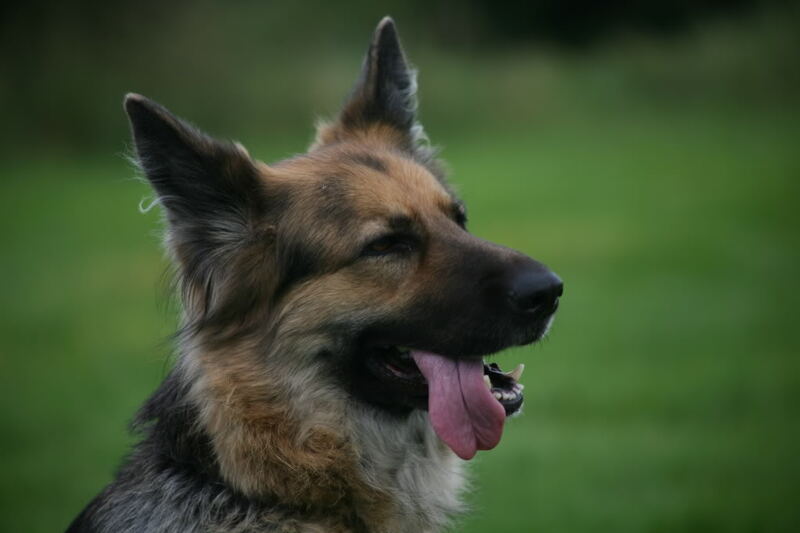 Listen up dogs--Staying on your best behavior could allow you to live longer! At least that is what researcher Vincent Careau of Université de Sherbrooke of Canada has to say. He is an evolutionary biologist that decided see if their was any link between longevity and behavior in dogs. Since modern domesticated dogs are mostly the product of artificial selection (as opposed to natural selection), he says we can study this in a way that wouldn't work with wild animals. Careau's research indicates that "More obedient dogs like German shepherds and bichon frisés live long for their size...Hard-to-train dogs like beagles and Pomeranians generally die earlier than do other, similarly sized breeds." He found that longevity was related to energy expenditure--for example, Labs tend to expend less energy than other dogs their size. Franjo Weissing of the University of Groningen in the Netherlands says that this is a little like the live-fast-die-young saying. As a four legged journalist living in the nation's capitol, I am often asked if dogs are Republicans or Democrats. We don't wiggle our butts over politics; we are equal opportunity belly-rub recipients. One thing is for sure: both Republicans and Democrats love their dogs. This brings me to two high profile political dog lovers in the news this past week: The Obama family and former press secretary to George Bush, Dana Perino. Dana Perino is known as one tough Republican, but she also loves dogs. She even served as a fundraiser for her local Washington Humane Society's Fashion for Paws event. In her recent interview with Politico's Peter Gavin (video below), she talks about how Americans love their pets and the having a pet in the White House really helps to make it a home--no matter the political party in charge. She did teach her dog Henry some politically oriented tricks, but I bet he just does them for the treats. Watch the video to see that this White House reporter could not keep up with a 12 year old vizla. I would be remiss if I did not also mention that past week marked Bo Obama's first year in the White House. He did bark at Santa, but he broke down dog barriers by being the only non-guide dog to attend the White House easter egg roll. 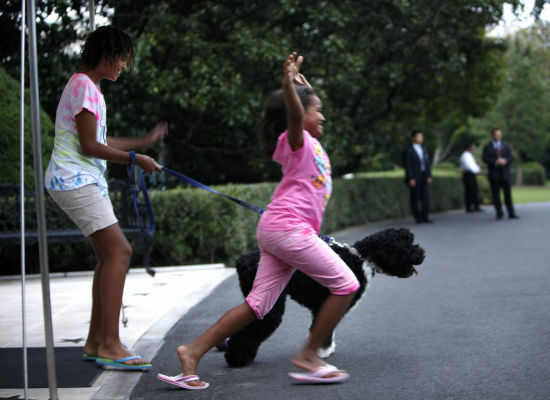 He is pictured here playing one of his most important roles as White House dog: posing for adorable pictures with the Obama girls. Huffington Post wonders "who is more excited to see the president's helicopter land?" I had the opportunity to get to know Surf Dog Ricochet earlier this year, and I even wrote about her in this post: "Ricochet redefines what it means to be a service dog." Well, my friend Ricki had tough start to her April. While chasing birds on the beach, she hit a piece of coral that sliced her ankle pretty bad. She needed stitches, and even had to wear the dreaded "cone of shame." She pouted for a while, like any dog would, but then she realized that a few stitches and a cone were nothing compared to what dogs with something like cancer deal with. With her new-found perspective, Ricki decided it was time to buck up and get back to doing what she does best--raising awareness and money for her favorite causes. As the spokesdog for the Pay it Forward campaign, she is a natural. Her latest cause is for the Morris Animal Foundation's Canine Cancer Campaign whose goal is to cure canine cancer in one dog lifetime (10-20 years). Her goal is $1,500, and she is so close! Click here to show your support. Be sure to follow Ricki's facebook page to keep tabs on her progress (and to check out all of her cute pictures). This post is a part of the BlogPaws "Be the Change" Challenge. I chose to profile Surf Dog Ricochet because she is always thinking about how to make the world a better place for dogs and people. 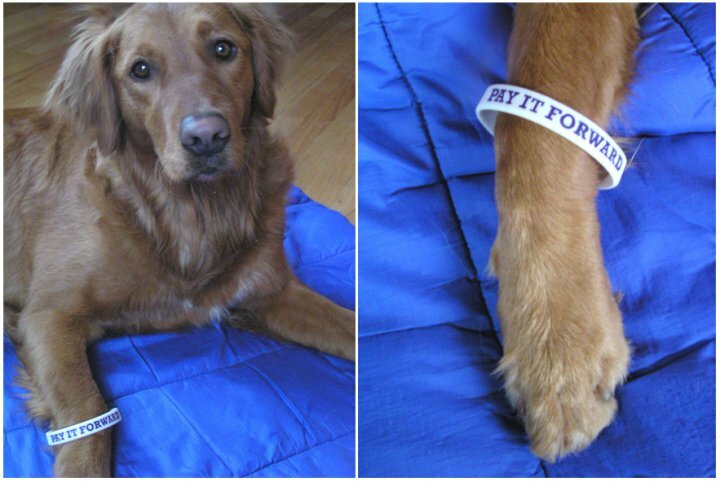 If you don't feel like you can do as much as her....that is OK, there are lots of other things you can do to lend a paw. As part of today's Challenge, BlogPaws bloggers are asking for your support for Pets without Parents. Even the smallest bit helps! In case you need a little inspiration, check out this great video from the BlogPaws team. The Washington Humane Society pulled out all the stops at this year's Fashion for Paws event. Hosted at the Italian embassy in Washington, DC, this was a super classy event that raised over $320,000 for needy pets in the nation's capitol. 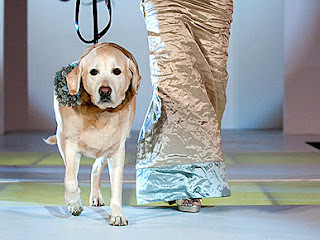 People Pets put together a great slideshow if the dogs in couture. The models were in high fashion mode too, but the cameras were on the dogs on the CATwalk! The human models were not ordinary models--each model had to raise a minimum of $3,000 to participate--with some far exceeding that. Even former White House Press Secretary Dana Perino was strutting her stuff for pets in need! Snoop was going to be a pest detection dog, but after the scandal involving defective chinese drywall, John Burrows had a different idea. Snoop was sent for training at the Florida Canine Academy to specialize in chinese drywall detection. 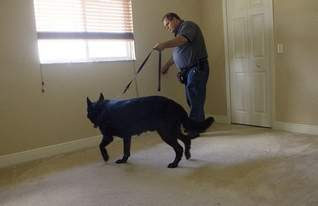 The Florida Canine Academy puts dogs through 800 hours of training necessary to become a professional stiffer for everything from bombs to money to mold. The $385 inspection provided by Snoop and burrows is cheaper than traditional inspection, and it doesn't require cutting holes in your walls. He was booked for 15 appointments as soon as he returned from training. Keep up the good nose-work Snoop! 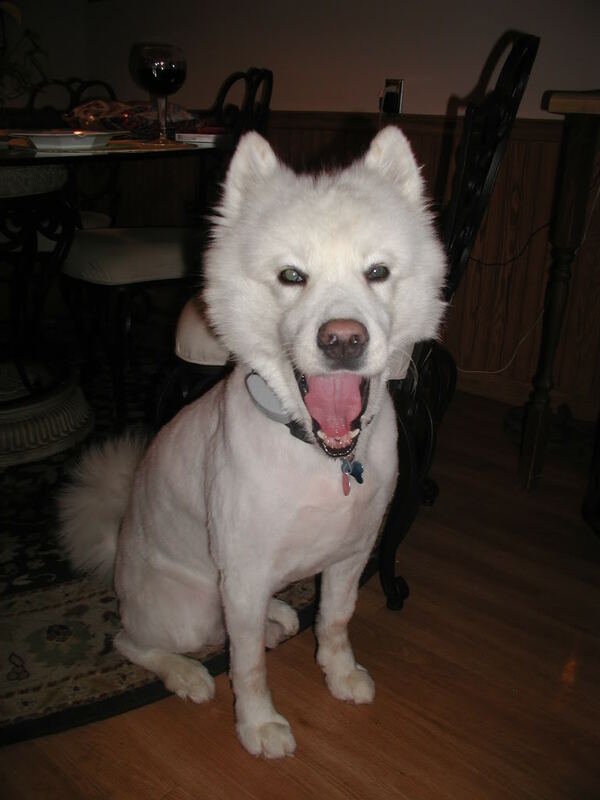 Just don't take so much hair from your dog that he needs a dog-fur sweater like this guy pictured here. Wags to my friend Maggie for her new gig at EcoSalon! You can also find her at OhMyDogBlog.com. I just returned from the first ever social media conference for pet lovers: BlogPaws. While there I was able to network and learn from over 200 like-minded web folks. The amazing part is how dedicated the community is to promoting the welfare of dogs and cats in need. Check out this inspiring video that some of the conference attendees put together to show how blogging, twittering, facebooking and everything else on the web is being used to help pets. Kudos for the creative use of Glee's version of "Don't stop believin'"!! I'm here at the BlogPaws conference learning how to make the Scoop even better, and I am off to a great start. I was chatting with YourDailyCute, and she told me how to let my readers get my content right in their inbox! Check out the sign up box to the right (under my logo and blog description). My content will arrive in your inbox every morning...what a great way to start your day! When Marshall Lee hit rock bottom in his life, he was lucky that his rescued basset hound Antigone was there to help him through it all. After losing his job and becoming depressed, Marshall even considered suicide. But the thought of leaving Antigone behind with no one to care for her was enough to pull him through it. By chance, Marshall was given a bike and decided to go on an unusual journey. He decided to bike from Chicago to San Francisco with his loyal basset right behind him in a baby carrier. 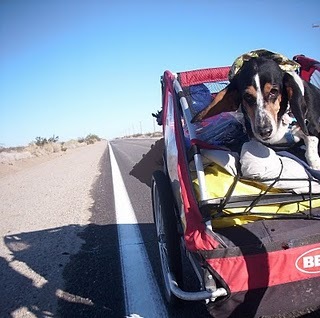 Along the way, he made it his mission to raise awareness about two things close to his heart: suicide prevention and basset rescue. They arrived safely in San Francisco, and decided to stay out west. They have since found a place to live in Puget Sound, Oregon. "I like the feel of the sofa. I can lay around on it for hours. Sometimes I lay on the floor just to remind me how much I love that sofa. I've always been a fan of a sofa. Even bad sofas are likable. The companion is always worried about where we are going to live and a job. I don't care where we live really. As long as there is a sofa. A sofa must be in the top ten, top three things in everyone's life." Her blog is really a great story of their wonderful journey together. 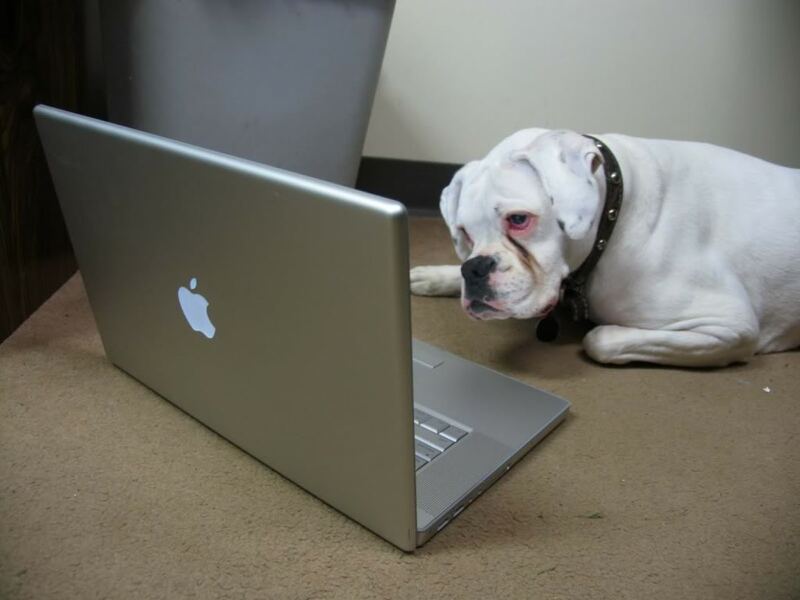 Now she is even working on her own autobiography, "Antigone Goes West: The Autobiography of Antigone Puppleupagus. "I will look forward to reading it! 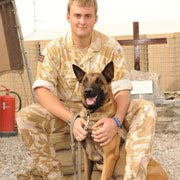 Chocolat is another hard working dog stationed with the British military in Afghanistan. He recently found himself in the news after he sniffed out a Taliban IED factory that had enough equipment to make at least 10 bombs. He was with his fellow troops patrolling a marketplace when he knew something was up in one of the buildings. He safely led his handler through the booby-trapped building to the bomb making materials. Check out the video here. Chocolat works hard, but plays hard too. His handler, Private Steve Purdy (pictured here) says, "He tends to wake me up a lot in the night just with his toy wanting to play, or he'll destroy something that's close by - like my flip flops." When he is not busy being a hero, it sounds like he is a regular dog during down time. Sully was sure down on his luck. The Great Pyrenees was walking down the side of the road as best he could missing one of his rear paws. It had been amputated by his previous owner, but it appeared he had been living on his own for a bit, as he was underweight. A good samaritan came his way and helped Sully link up with the Great Pyrenees Rescue Society right there in Texas. The rescue group immediately sprang into action and got this big guy over to the Texas A&M Vet School. The vets worked with Ortho Pets Inc in Colorado to set Sully up with a custom-fit prosthetic paw! Sully can not only walk again, but even run! Check out the video from KBTX. Things get even better--While Sully was in the excellent foster care of a veterinary student, he found a forever home! His new family is out in Connecticut....where I bet he will go on to live a great life. What a great story about people from all over the county coming together to help out one dog down on his luck. While Sully has a home now, Blue, pictured here does not. 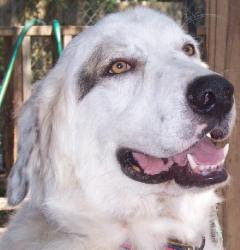 Contact the Great Pyrenees Rescue Society to learn more about him and other available dogs. Dogs sure know when to pitch in. A lion cub was born in Siberian Royev Ruchey Zoo, but her lion mama did not survive the delivery. Lucky for her, a local mutt that recently had puppies was willing to help out. 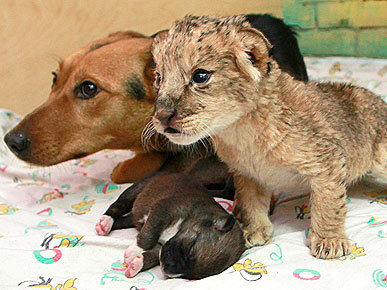 She is seen here with one her puppies and lion cub--who is almost as big as her! More photos of the pair here. Plus 3 cool photos of the lion cub here. I have trouble staying calm around squirrels, so this story really amazes me. 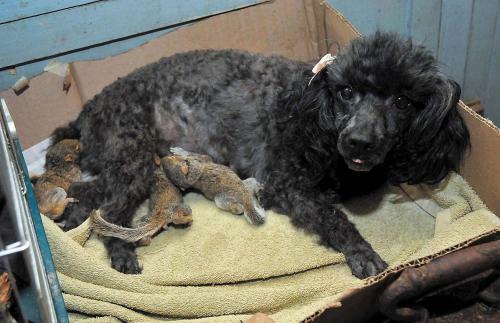 Pixie the toy poodle isn't just calm around these baby squirrels, she is nursing them! Yes! Playing mama to some baby squirrels. The squirrels had lost their home in an incident involving a chainsaw. Pixie's own pups had just recently been weaned and sold. The timing was just right for the pooch to take in the baby squirrels until they were old enough to be on their own. They have since moved to a nature preserve nearby. According to her person, the generous mama misses them, but "dog biscuits seemed to help Pixie's recovery." Wags to my buddy Shep for keeping tabs on the squirrel news!